I was drawn to the design of the Retro 51 Hex-o-matic as it looked somewhat like the Rotring pens which I was less likely to get my hands on. The design is very similar and in the black version of the Hex-o-matic there are very few visual differences. From the off you are impressed with the Retro 51 Hex-o-matic. 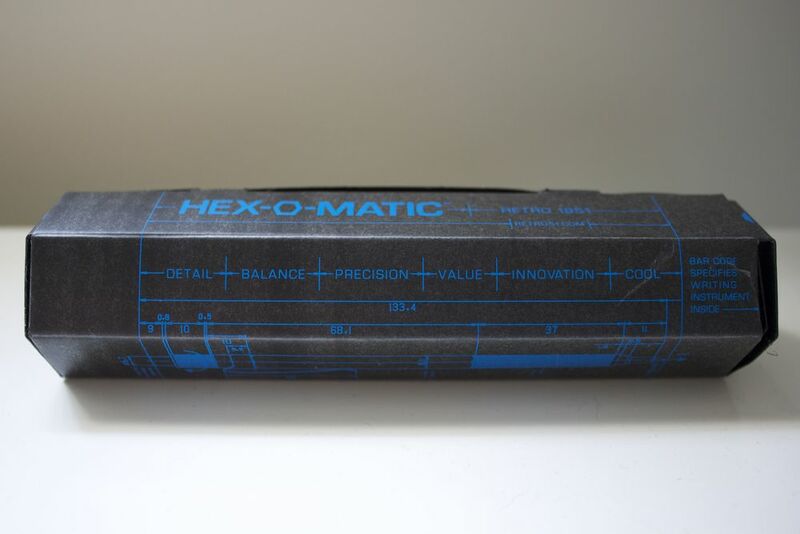 The packaging shows some real attention to detail and hints at the quality you are going to get with the Hex-o-matic. It comes in a hexagonal black box (clever) with design line drawings in a bright blue print that really pops from the pack. It's pretty impressive. On delivery my box was pretty squished so perhaps it is not the most sturdy of packages, however thats what you get from lovely postal companies some times. There are some great call outs on the packaging as well. 'Life is too short to carry an ugly pen' is something that I definitely agree with. The Retro 51 Hex-o-matic looks like a serious pen. It slim, sleek design gives the pen a sense of superior quality. From this perspective it ticks a lot of boxes. The slim barrel has a predominately hexagonal design - hence the name. The grip section on the Hex-o-matic has a knurled section which is subtle and not over the top, but makes the pen a bit easier to grip and write with for long periods. The knock at the top of the pen comes with the traditional Retro 51 design keeping the element of brand design across the range. The knock feels stable and secure and gives a nice loud click and has a great retro bold 51 logo right on the top. The pen clip also has the HEX-O-MATIC branding around the barrel with the O taking the shape of a small hexagon. Basically Retro 51 have thought through the design of the Hex-o-matic from top to bottom. It's branding from all angles and I like it. I was really surprised when I first pulled the Hex-o-matic from its packaging at how heavy it actually is. Now the Hex-o-matic barrel is slim, like a lot slimmer than you will get for other pens. Think pencil slim. For such a slim looking pen I was surprised about the weight. This does give the sense of superior quality products being used to create the pen but nonetheless this took some getting used to. After a while i don't really notice it too much and I didn't notice any issues writing for prolonged periods of time. Where do I start on the subject of the refill. The Retro 51 Hex-o-matic comes with a EasyFlow 9000M refill in black. This gets a lot of good press for being a hybrid ink which ensures fast drying time, a smooth writing experience and dark lines. Clicky Post does a bespoke review on this refill and Mike gives the refill a good write up. Now the refill definitely gives you the dark lines it promises, which you can see in my handwritten review. Fast drying ink also ticks a box, I have not found any issues on this front when I have been using the pen. The Easy flow 9000M is a 'Parker style' refill which means that there are other refill options that would be suitable for this pen. One huge downside on this refill for me is there is no Fine option. This only comes in either a Medium or Bold nib which leaves me with limited options trying to get a super fine writing line. Using The Well Appointed Desk's awesome epic refill guide I will definitely be looking at an alternative refill option as I really do not like the EasyFlow 9000. I need to find a hack that will give me more enjoyment from using this pen. I think that the design on the Hex-o-matic is great. This looks like a smart stylish pen that makes you feel like you are using something of quality. It's a shame as I have heard positive things about the Schmidt style refills and there are numerous reviews which give praise to the EasyFlow 9000M. I would definitely recommend this pen despite the refill issues. Refills are something you can get round. This pen is pure quality and a great smart little pen which I enjoy using in my rotation.